The new FC-76D is an updated version of the original FC-76 from 1980. The multi-coated fluorite rear lens and eco-glass front element provides maximum light transmission. The design takes advantage of the advances in high resolution digital imaging. The advanced design allowed the focal length to be reduced by 30mm 594mm at f/7.8. The DS model features a 2.6” focuser for imaging with CCD cameras and DSLRs. A sliding dew shield is also included and a larger OD 90mm tube. The FC-76DS model features the Sky-90 2.6” focuser to better hold imaging packages which include DSLR’s and CCD cameras with filter wheels. A dedicated and flattener as well as extender are available to further enhance the capabilities of the FC-76DS. The tube diameter is 90mm and includes a retractable lens shade. The dedicated reducer changes the focal length to 417mm with a focal ratio of f/5.5 and an image circle of 36mm. While the dedicated flattener at f/7.8 and 594mm produces a 40mm flat circle. 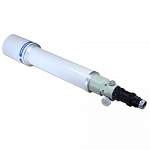 The model DC uses identical optical components (same focuser as FS-60C) in a smaller and lighter tube with a fixed lens shade and weighs a little less than 4lbs. The DC is easily transported and easy to set up. 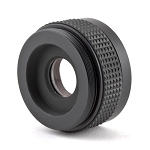 The tube OD is 80mm and includes a fixed lens shade. 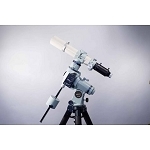 Both models are allow the user to use either for solar eclipse imaging. Both can be carried by the Teegul Sky Patrol III or larger PM-1.